I will ride with caution and within my ability. I will know and use the regulations and rules for the snowmobile park. I will keep to the right and yield the trail right-of-way. I will slow down when approaching other trial users. I will not snowmobile where use is prohibited. 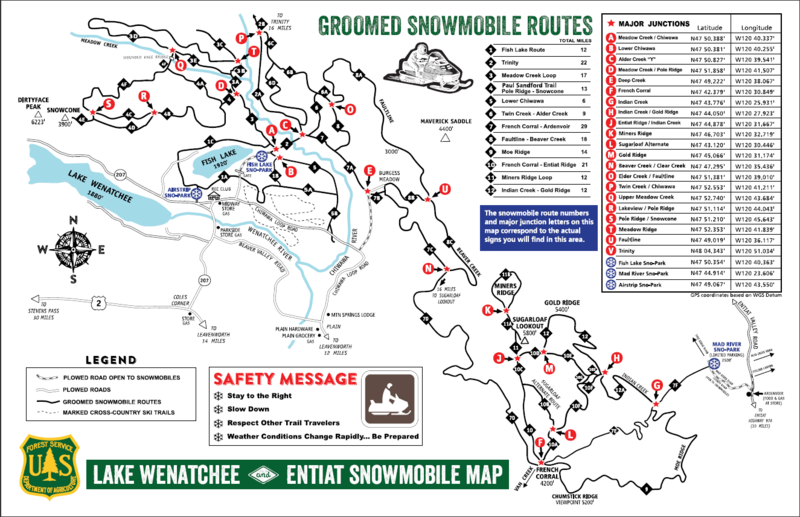 I will be respectful when riding near snowshoers, dogsledders and skiers. I will pack out everything I pack in. I will not harass wildlife. Plan your routes ahead of time and stick to them. Inform someone of your planned route and let them know when you plan to return. ALWAYS travel with at least two snowmobiles in your party. Have enough fuel for your trip. Check weather forecast before you leave on your ride. We provide you with quality helmets that are easy to use. An approved helmet is a critical piece of headgear and should be worn at all times when riding a snowmobile. It can help keep you warm as well as protect you from serious head injuries in the event of a crash. Always ensure your helmet fits snugly and have the helmet's strap tightly fastened under the chin when you're riding to achieve full protection. You need a variety of proper apparel and gear to ensure your snowmobile outing is safe and enjoyable. Make sure you dress in layers to be prepared for changing weather conditions which can vary greatly from when you start your trip to when you return. Wind chill factors experienced from your moving snowmobile along with winds must also be managed to prevent potential effects from frostbite. Most importantly, always avoid cotton materials in all your clothing layers since it can get wet and freeze, drastically reducing your comfort and safety. Layers of clothing you wear underneath your snowmobile suit are crucial to staying safe and feeling comfortable while riding. On cold days, layers can provide a barrier from cold, wind chill, and frostbite. If you have too many layers on you can always remove some during your trip, but if you don't put enough on before you start, you can't add more later. Good winter boots are very important for making your outing enjoyable by keeping your feet warm, comfortable, and protected from snow and water. Choose boots that fit well and are comfortable for a long day of riding.